No Football? No Problem: The Big Cheesy is Back! 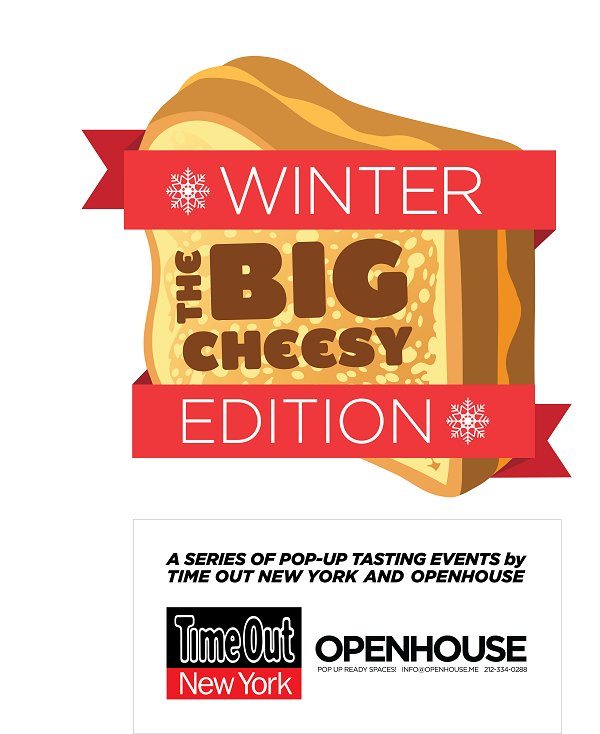 Besides Thanksgiving turkey, there’s no more loved food event than the Big Cheesy. Six New York chefs remix the grilled cheese with embellishments like pulled pork, candied bacon, and smoked mushrooms. All the while, Goose Island pours lagers and you decide who’s best like Ramsey Michel and Anton Ego. Since 2011, NYC’s most promising foodie startups sharpen their knives here – including Melt Shop, Little Muenster, Milk Shop and Lucy’s Whey. Last year, upstart 5 Oz. Factory beat out the competition with a grilled mushroom, asparagus, provolone, brie, horseradish number. Alex Mitow’s All-American Diner took second with garlic-buttered challah, pastrami and chipotle apple aioli. This entry was posted by Rosemarie on Tuesday, January 20th, 2015 at 11:08 am	and is filed under American/Comfort, Events, Nolita. You can follow any responses to this entry through the RSS 2.0 feed. You can leave a response, or trackback from your own site.